So… what do we know about Borussia Mönchengladbach? Since “Supercalifragilisticborussiamönchengladbach” is one word, shouldn’t it come under S? Shurley just a minor technicality Niel, but correct ! Is ‘Simonsen’ the fella who pitched up at Charlton in the early 80s? Yep, the man who beat Keegan to European Footballer of the year in ’77, the only man to ever score in the final of the three European club competitions, was miffed that Barca had signed some kid called Maradona, which wouldn’t make him an automatic choice any more, so he turned down Real Madrid (and Spurs) to go into the Valley … from victory to stone. We beat them on pens in the European Cup in 1971. It’s that bloody Berti Vogts again! Arrrgg! While we’re on German football, may I warmly recommend the film “Das Wunder Von Bern” (The Miracle of Bern)? Unless you were a teenage armchair Honved fan, I suppose. A fond tale of the ludicrously jammy 1954 World Cup winners, and very much the creation of West Germany as a coherent country. Mate of mine bought it for me to allow me to understand his ropy Kaiserslautern dialect. If you’re ever with a German and it’s raining, if you describe the weather as “Fritz Walter Wetter” they’ll probably buy you a drink. Not much to do with Borussia Moenchengladbach I suppose. It’s curious that when the Allies abolished the state and even the word “Prussia”, it still lived on in some football team names (“Borussia” is the latinised form). 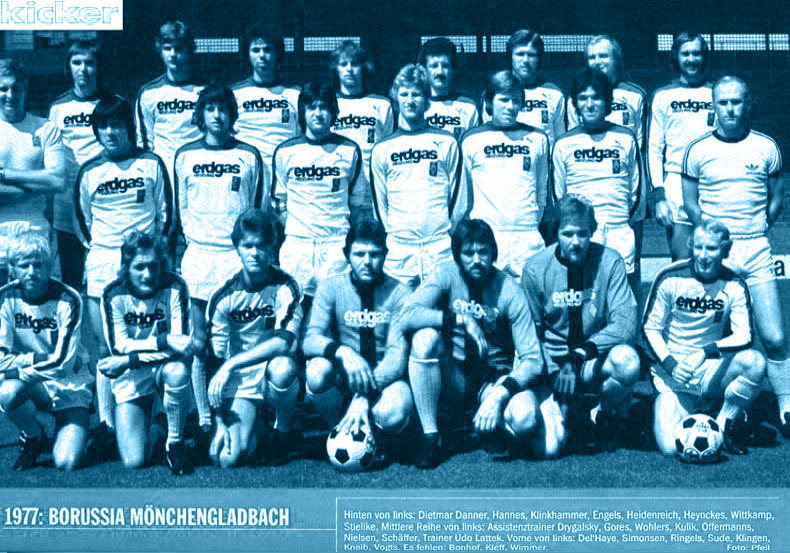 Terry Collier was stationed in Mönchengladbach in the hiatus between ‘The Likely Lads’ and ‘Whatever Happened To The Likely Lads?”, and said it was like West Hartlepool; Barry Taylor from ‘Auf Wiedersehen, Pet’ also worked there but hated it so much he moved to Düsseldorf. Who’s the least popular fan at a Borussia Mönchengladbach match? Ich werde meinen Mantel bekommen. @Warden Hodges. Some conjecture there. History records that he was, but I also read that Catterick favoured Rankin for a spell in 70-71. Intriguing. I do believe the coach standing behind Bertie Vogts has got a semi on. I’ve loved the name “Klinkhammer” ever since 1977. ‘NeilTheChimp’, …”If you need a shoulder to lean on”, Bertie’s yer man! This is something I have to know: Did HMHB write this line or did they borrow it from a terrace chant? Original creator is a genius. I’ve never heard any suggestion that it isn’t original (and I lived & breathed every second of the Liverpool/BMG rivalry in the 70s so I would have known if it was any sort of terrace chant). Part of the genius is that he could easily have kept on with the Mary Poppins tune & got a rhyme or two out of it, but like this it’s just a guerilla lyric in the middle of another genius guerilla lyric.